A rotund and admittedly needy cat named Bruno made waves on the internet last week, penning a heartfelt adoption letter on Facebook that outlined some of his quirks. 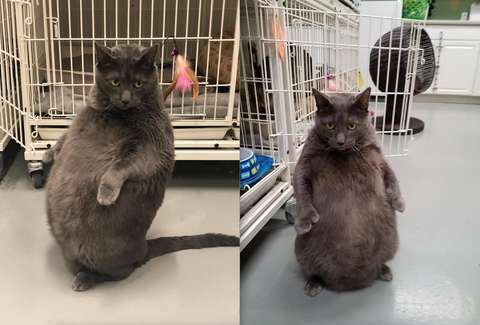 Bruno, who stands on his hind legs when he's hungry, is no longer scanning prospective adoption suitors at Wright Way Rescue shelter in Grove, Illinois, however. He's been adopted, so now the world can rest easy. Just who are the lucky parents welcoming this high-maintenance fur-ball into their home? Lauren Paris, 29, and her boyfriend, Jason Bartlett took the portly cat into their Chicago apartment on Tuesday, reports Buzzfeed News. Now, Bruno's laundry list of needs and eccentricities -- which include excessive meowing and very particular sleeping arrangements -- fall squarely on the shoulders of the young couple. And the list goes on. Luckily, Paris was up for the task, telling Buzzfeed: "When I saw a photo of Bruno that had been shared on Facebook I just...freaked...It was this wild combination of an excited laugh/cry. And I felt this insane drive — I knew I would do whatever it took to be his forever home." Paris also went the extra mile to Bring bruno into her clutches. She seized on the cat's viral fame by singing a song called "Give Me The Fat Cat," and posted the performance to Facebook. (She also filed an official letter of intent with the shelter). Now, she's definitely got the fat cat. Just because Bruno has found a home it doesn't mean you can't follow every last moment in his incredibly needy life. He's on Instagram, where you can follow his corpulent exploits on a daily basis.